Caught a replay of Andrzej Gołota’s title fight with Mike Mollo from back in January last night on Eurosport. 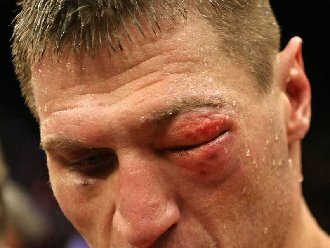 The derby (both boxers Chicago residents) went the distance, with Gołota taking some punishment from Mollo’s right hand leaving him with an eye that always looked like it could cause the fight to end. Nevertheless, Mollo looked to have blown it towards the end, being twelve years Gołota’s junior his game plan clearly relied on the fight not going the distance. After 12 rounds Goota was awarded a unanimous decision, and the WBA Fedelatin heavyweight title, yet appears not to want to take this opportunity to retire. Indeed as Geoffrey Ciani reports, Gołota looks set for a match with Shannon Briggs, another aging veteran, though both with the potential for a crack at the title, something which has evaded the Polish emigré despite his technical abilities. Given the two boxers’ varied styles, perhaps another hare versus tortoise race awaits in the near future.